Congratulation for PPI Oxford as the 2nd Winner/place for PPI Cabang of the year. Last week (Sat, 8 Nov) Indonesian Students Association United Kingdom (PPI UK) has held Presidential Election period 2014/2015 in London. There were 35 members of PPI Cabang around the UK who are participated for this event. PPI Oxford sent Yudhistira Nugraha (President) as the representative. The first agenda discussed about an annual budgets, introduction of 35 PPI Cabang, then winners announcement of this year. PPI Cabang of the year is the annual award who has been given by PPI UK to PPI Cabang due to their proudly achievement. There are three indicators of assessment; such as the programs, the contributions and participations. The assessments are divided into 3 categories; firstly, large scope which has more than 50 Indonesian students in every cities, medium scope (21-50 students), and small scope if less than 20 students. 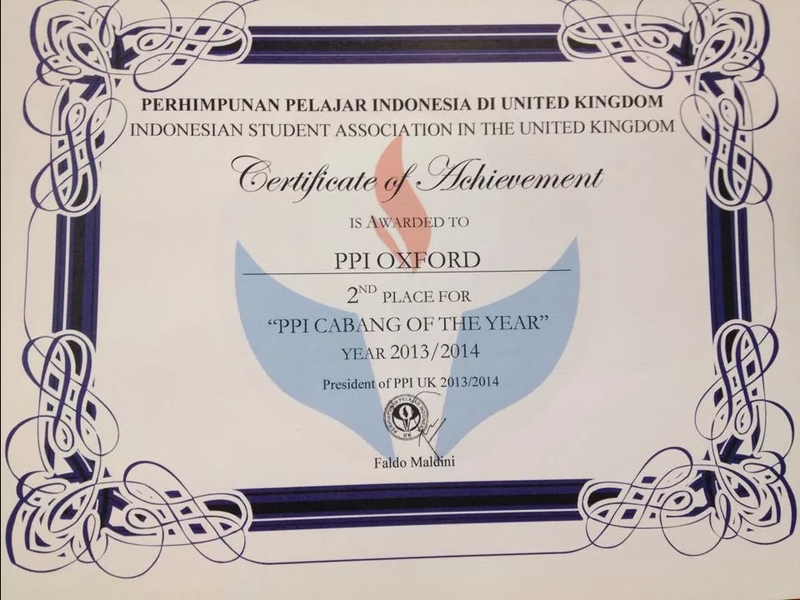 Finally, PPI UK announced PPI Oxford as the 2nd winner of PPI Cabang 2013/2014. We would like to say thanks to committee 2013/2014 who had succeed this achievement.